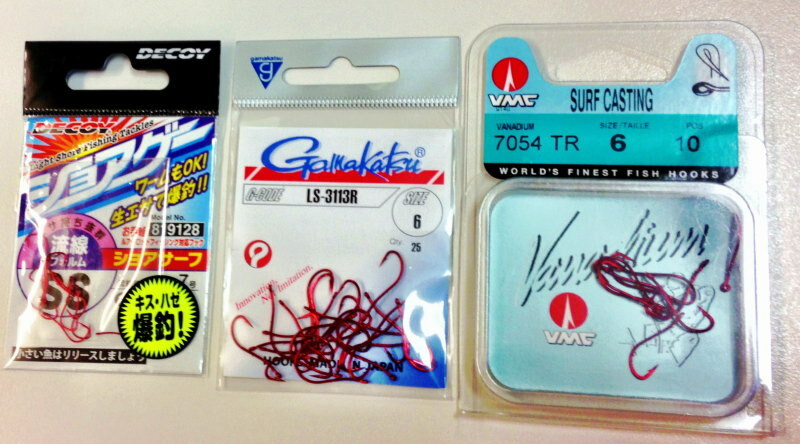 A few weeks back I decided to explore the benefits of Japanese style worm hooks and purchased a few examples from Decoy, Gamakatsu and VMC. My interest came from a boat tournament I fished earlier this year (with bait), when I had some success on Japanese rigs that featured red Owner worm hooks. The hooks worked well with small ragworm and had a good hookup rate, which made me wonder if they would be good with Marukyu Isome and Gulp Sandworms. It's still early days but the Decoy hooks are fast becoming a favourite. They maybe the most expensive but have a much finer gauge wire which helps hookups when fishing the split shot rig. The longer shank of these hooks help to place the hook point further down a section of artificial worm, plus the shank features a bait holding barb that helps maximise perfect presentation for longer. If that wasn't enough, this style of hook gives you the option to fish semi weedless as the hook point is almost inline with the eye. Where did you buy these from? Really getting into LRF but have found that the isome worms often slip down the shank of the hook as they are retrieved. Would like to try these hooks out as they could sort out my problem!